Laid down, 18 June1944, as a Maritime Commission type (VC2-S-AP2) hull, under Maritime Commission contract (MCV hull 536) at Permanente Metals Corp., Yard No.1, Richmond, CA. Decommissioned, 4 January 1946, at San Francisco, CA. Inactivated in 1953 and laid up in the National Defense Reserve Fleet, Suisun Bay, Benecia, CA. 110k USS Boulder Victory (AK-227) at Ulithi, 9 June 1945, after being drydocked there in USS ABSD-2 to repair mine damage. 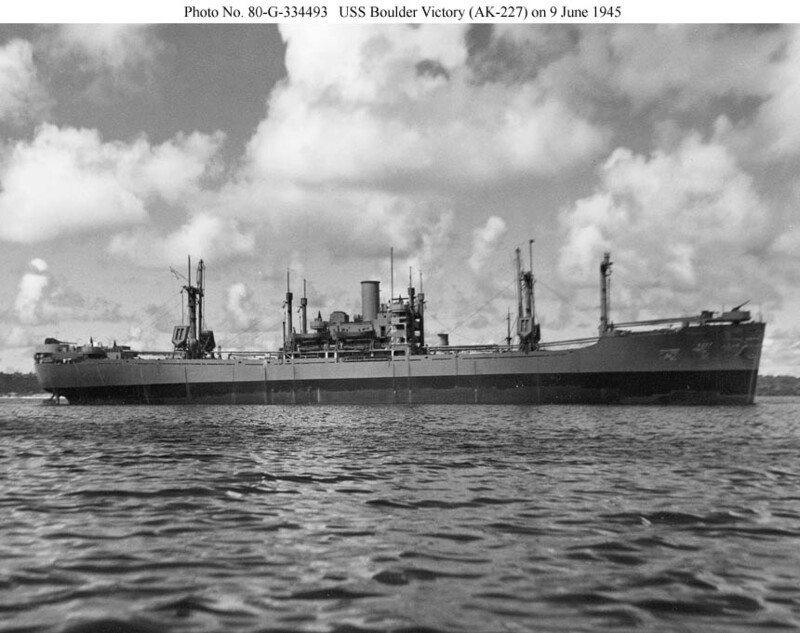 While departing Kossol Passage in the Palaus on 20 December 1944, Boulder Victory struck a mine that blew a hole 18 by 32 foot in hold number three. The mine failed to detonate her cargo of ammunition and there were no crew injuries.